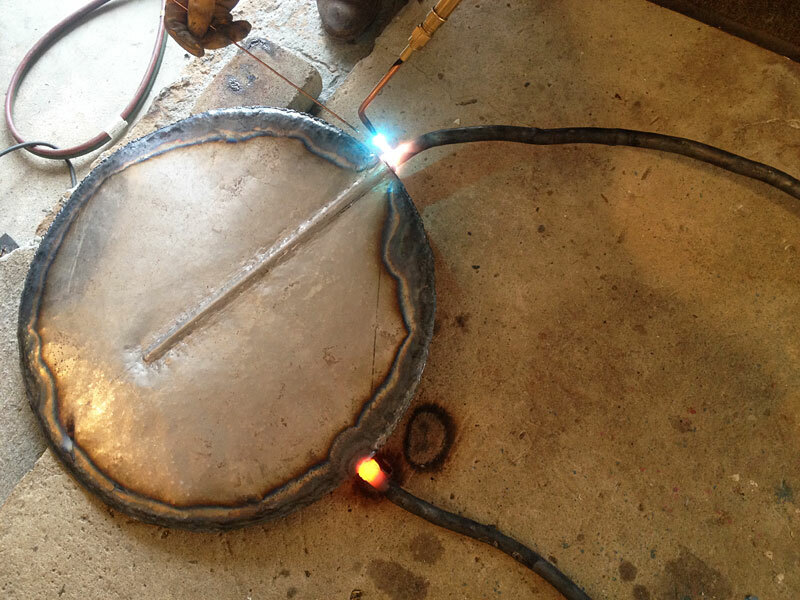 Welding the seam of 22 gauge steel to make a shape resembling a ceramic capacitor. This will serve as an armature. Finishing work will be done with Bondo and sanding to hide imperfections, such as the dimples caused by the pining hammer. Two circles of 22 gauge steel were shaped using techniques from old-fashioned auto body repair. Repeated tapping with a pining hammer introduces a gentle curve to the steel by stretching the metal incrementally. The same method was used to define the channel where the capacitor leg attaches. A slapper was used to counteract the effects of excessive or uneven pining (a slapper will flatten metal out). For more information on manual techniques in auto body shaping: http://www.metalshapingzone.com. Their how-to video is well-worth the money. Classic car restoration tools can be found on eBay. The two halves of the capacitor head were welded together (and sometimes brazed with a filler rod because it is easy to blow a hole through thin steel when you are torch welding). Clamps were used to hold the seam together as close to the weld as possible, as steel wants to warp or shift when it gets hot. The legs of the capacitor are hollow steel tube filled with sand to prevent the tube from collapsing when shape was introduced with heat and hammering. Once the legs were shaped, I removed the caps (holding in the sand) and welded the legs to the head of the capacitor.